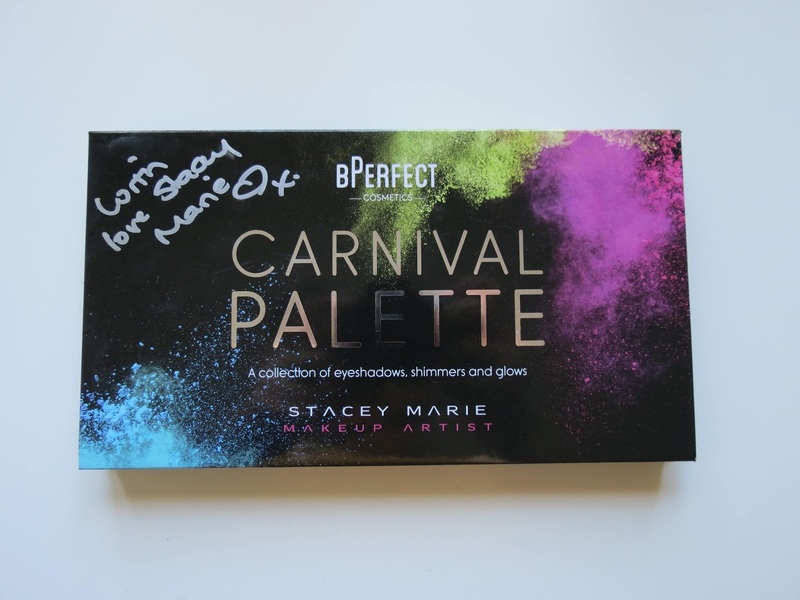 There's nothing like being invited to a makeup launch to get you back into the blogging mood, especially if its for one of the hottest beauty releases as of late: the Carnival Palette from Stacey-Marie's collaboration with BPerfect Cosmetics. I'm back! The Leaving Cert is well past and gone; the only thing on my mind these past few weeks has been packing for Zambia, meeting up with friends and Love Island. 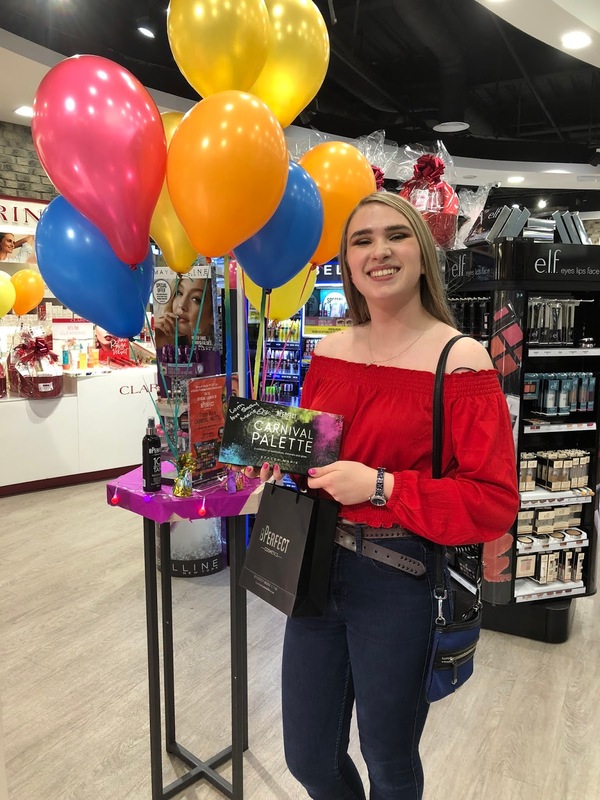 But more on my summer and summer plans in a future blogpost though, because today I am bringing you my experience from Stacey-Marie and BPerfect Cosmetics' launch of the Carnival Palette in Dundrum shopping centre, as well as my first impressions of the palette itself. As soon as I saw the Carnival palette and its crazy but cool colours everywhere on Instagram, I knew I had to get my hands on it. So, I was delighted to be invited to the event and to receive the palette on the night. 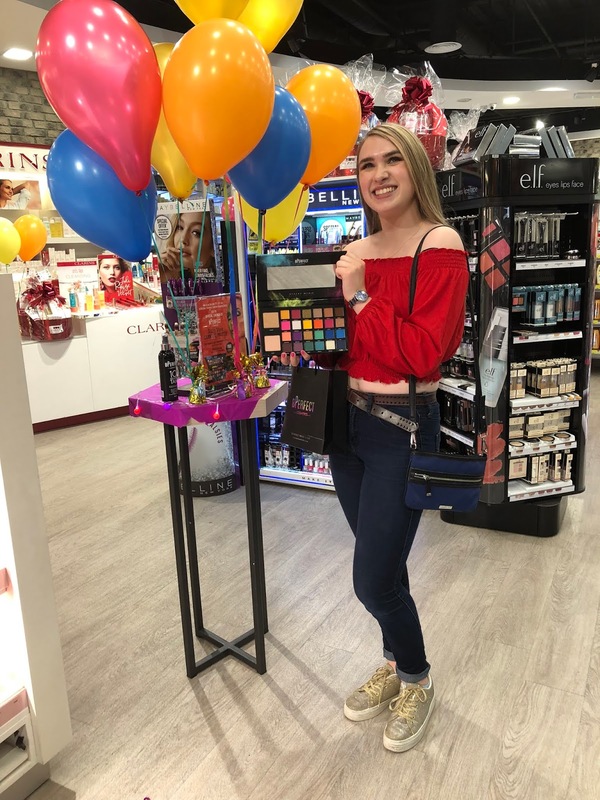 The launch was in McCabes Pharmacy in Dundrum, and consisted of a demonstration of the palette from Stacey-Marie herself. Stacey-Marie used her palette to put together a stunning blue and purple eyeshadow look. It would be perfect for any night out, the bold colours replacing your usual neutral smoky eye. 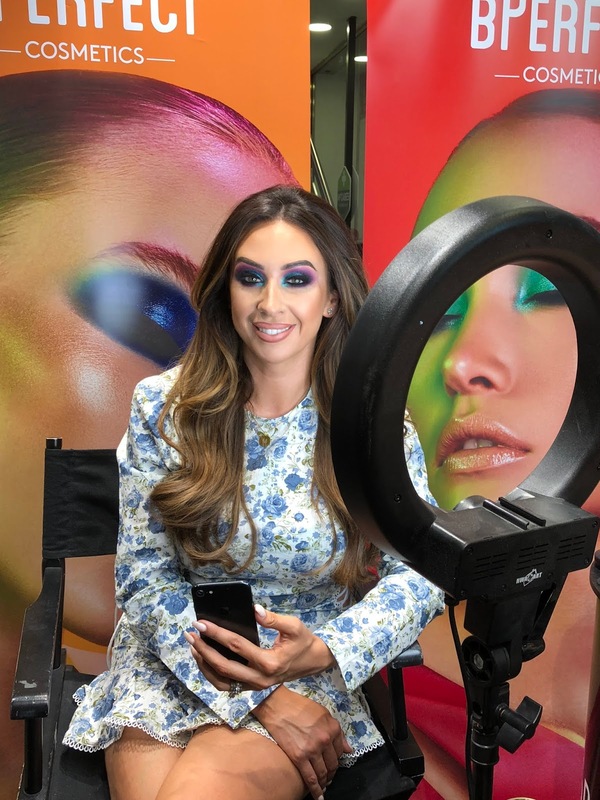 I found it interesting how Stacey-Marie decided to not include a black shade in the palette, showing her passion for bold and bright colours, which are taking over the eye makeup game. 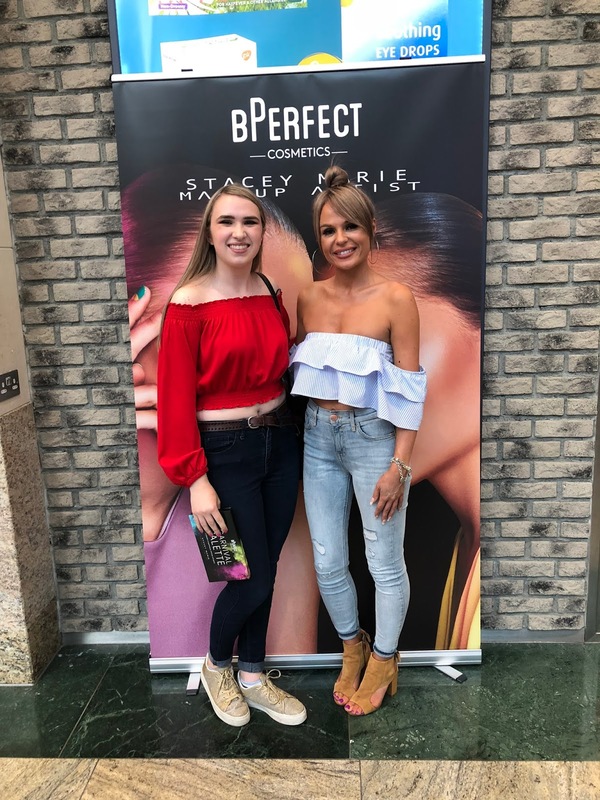 Throughout her demonstration, she answered any questions the audience had about the Carnival Palette and makeup in general but also questions about Stacey-Marie and her career as a makeup artist. I got to ask her if she could only use two shades from the palette, which ones would she use; her answer was 'Hustle', a khaki green shimmer shade and 'Liquor', a matte berry red. Stacey-Marie was a genuine, friendly and likeable person. I felt like I got to know her more during the Q & A. I and my friend Anna (thanks for tagging along ;D) also had the pleasure of meeting her and having the chats after the demo. It was a lovely evening; it made me even more excited to use the palette. What first caught my attention is that the Carnival Palette is bursting with many diverse but usable colours that just scream summer and the festival season. It has 24 eyeshadows, 17 mattes and 7 shimmers, as well as two highlighters and a handy mirror. Stacey-Marie said herself that she wanted every shade in the palette to be loved and used; for her, none of the colours in the palette are just there to fill a space. When first swatching the eyeshadows in the pharmacy onto my arm, I was impressed by the pigmentation and colour pay-off. The colours that caught my eyes first were 'Queeny', a gold shimmer shade, 'Keen', a bright yellow matte colour, 'Hush', a rose gold shimmer, 'Breezy' an icy blue shimmer, 'Wifey', a bold pink, and 'Lit', a bright orange. 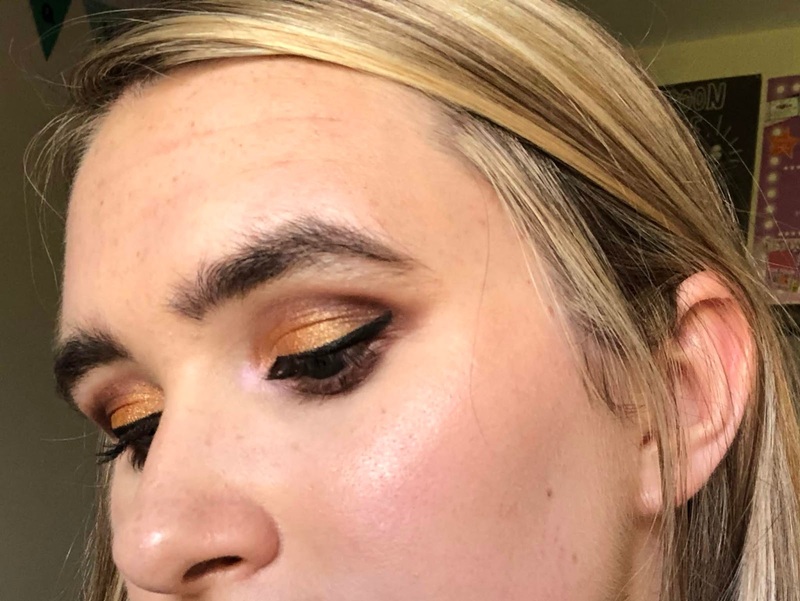 I tried out two looks using the palette to gather my initial thoughts. I first tested the colours 'Rowdy', a matte brown, which I blended into the crease, and 'Keen' and 'Queeny', applied onto the lid together, to create my current everyday eye makeup look. I also used what I thought would only be a white shimmer eyeshadow, 'Pink Me', but I was pleasantly surprised by the gorgeous hint of pink in this colour, which is subtle but still noticeable. It's one of my favourite shades on the palette now, perfect for a touch of highlight in the inner corner of the eye. I also tested the highlighters and discovered that 'Sinner' was a bit too dark for my complexion. I then applied 'Saint' to my cheekbones, the ideal pink highlighter for my skin tone, and it was very easy to apply and quite pigmented. Next, I decided to try out a more wild, crazy look inspired by Stacey-Marie's demonstration at the event (though not near as good of course). 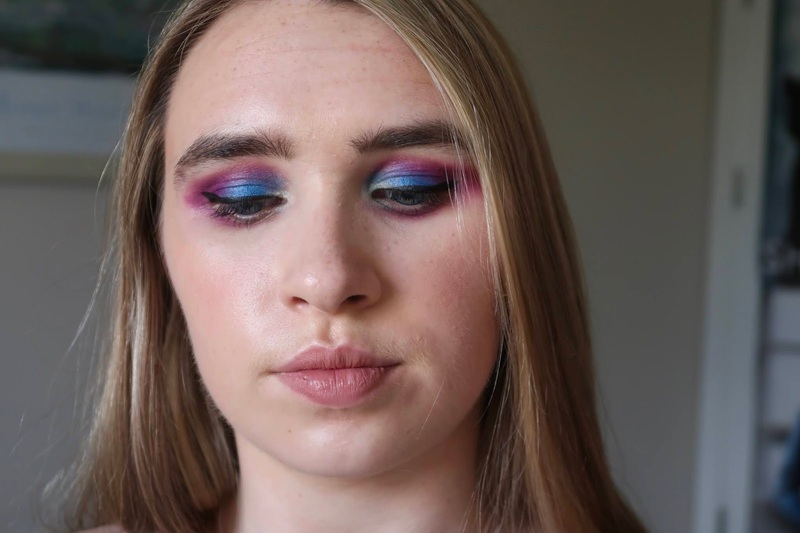 I blended two purples, 'Chant' and 'Wasted' into the crease, then applied the light blue 'Sky' shade all over the lid, blending the purple into it afterwards. I then added some shimmer onto the lid with the stunning royal blue shade that is 'Recharge', along with the white shimmer 'Moony' which I applied to the inner corner. All the eyeshadows I have used so far are blend-able and easy to work with. The colours pop straight away. 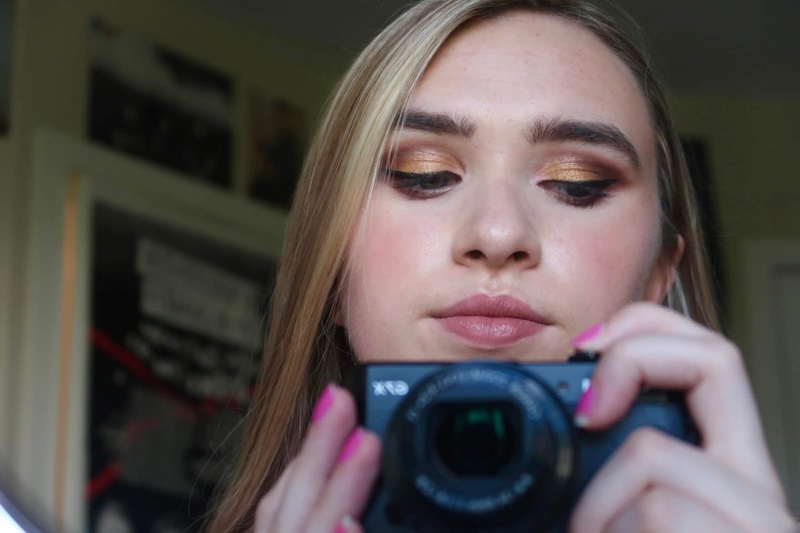 I wore the gold and brown look for a day out and I must say that the colour and pigmentation lasted well, just about all day. So my first impression over all is very positive; I cannot wait to try out more of the beautiful colours! Over the past year or so (in between the study sessions when I was going out, which was not often unfortunately), either day or night, I would always grab my trusty Modern Renaissance palette from Anastasia Beverly Hills. I'm hitting pan on it because I love it so much, but I've been looking forward to trying something new and being more adventurous with makeup again after the Leaving Cert. Now, I feel I have a new go-to palette for everything from wild colourful eyes to the everyday routine. Have you tried out the Carnival Palette? What are your thoughts? Oh my goodness, what a cool experience! That is amazing. And I absolutely love the look you created with the palette. Love all of the stunning colour. The palette looks gorge! I would love to try it but I only got Modern Renaissance and I need to chill when it comes to adding stuff to my collection. 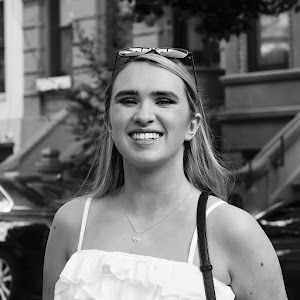 I'm so glad to see you back blogging after the LC, it was rough but I am so glad it is over.